Damavand Info organizes a wide range of quality tours to Mt Damavand and other Iran mountains for hiking trekking and ski touring. We have the most experienced Iranian mountain tour guide teams and many mountain clubs, tour agencies, mountaineering groups, individual mountain tourists use our guiding support each year. Visit our Guestbook. We offer custom designed VIP Private Tour in most seasons to best suit your team and support all the necessary logistics and services needed for the tour. (best starting days is Saturday). Visit also Crowd and Iran Holidays. If you have an inquiry about the price of a private tour to Mt Damavand Iran first choose an itinerary from Climbing Itinerary or Ski Itinerary then visit the Cost page and fill in the following form and send it by email and let us know the necessary information about your travel to Damavand Iran so we can estimate the cost pp for your plan based on the provided information and give you the best possible price. Recommended Itinerary is 5 Day itinerary. For more more visit Damavand Itineraries. This itinerary is one of the most favorite program for Damavand south route in summer. Visit also Damavand Météo. This is a sample draft itinerary, the starting point, number of the days in the program and other details are custom designed for any team. Feel free to make modification to this ample package to best suit your program. For instance you can add extra days if you need more acclimatization or just a reserved day for bad weather. Recommended starting day is Saturday. See also Crowd and Iran Holidays. 06 July: Day 1: Transfer from Tehran hotel to first campsite. O/N C1 hut/local house/tent. 07 July: Day 2: Transfer and trek to third campsite. O/N C3 hut/tent. 08 July: Day 3: Acclimatization day, go to higher than camp 3. O/N C3 hut/tent. 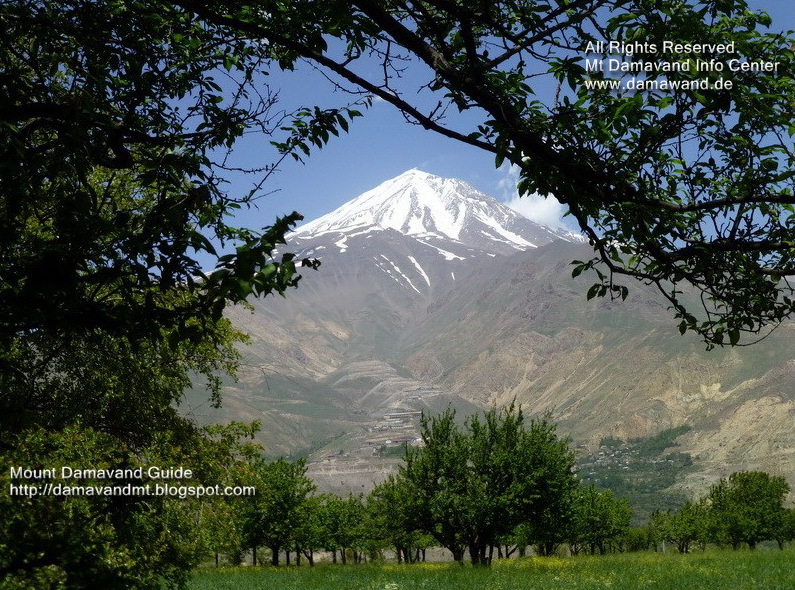 09 July: Day 4: Trek to Damavand summit and descent back to the camp 3. O/N C3 hut/tent. 10 July: Day 5: Descent to camp 2 and transfer to camp 1 and then Tehran. O/N hotel. The following included services and support may change by request. The final details are discussed and agreed by email and custom designed for each team separately. • Guide: Experienced ski/mountain guide. • Visa support: Iran Visa Authorization Code. • Accommodation: In first and third campsite hut/local house/tent. • Food: All scheduled meals (breakfast, lunch, dinner) while you are on the mountain camps. • Transport: All necessary land transfers from/to Tehran hotel & mountain camps. .• (Optional) Hotel charges in Tehran. Bed & Breakfast. Twin or triple bed rooms. 2 nights. 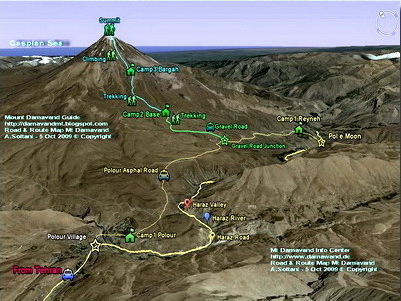 • Permit: Mt Damavand Climbing Permit. • Unscheduled days/nights on the mountain. • Unscheduled nights at Tehran hotel. We strongly recommended you to have all risk insurance in your country that covering medical and evacuation from all Iranian mountains and remote area. The insurance should cover also helicopter flight that could occur in the expedition. Damavand trekking tour 2019. Hiking, trekking and ski touring Mt Damavand 2020. Guided Iran mountain tours. Trek tours to Alborz and Zagros Mountain Ranges. Trekking tour crossing south to north of the Alborz Mountains. Best guiding teams to support Damavand trek. Hiking & trekking in Iran mountains. Competitive price for Damavand tours. Iran mountain climbing guide. Information for trekking tour. Climbing tour and ski tour to Iran mountains. 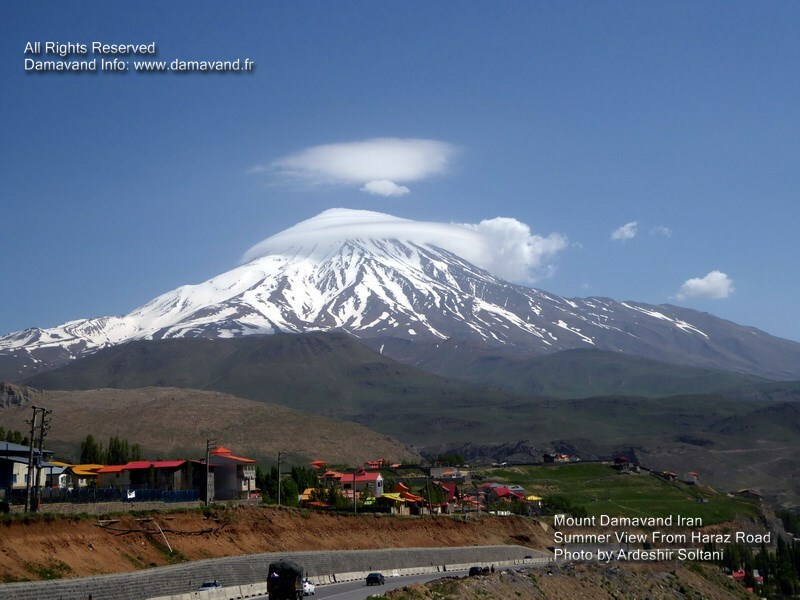 Damavand summer expedition tour. Climbing tour organizer to Alborz and Zagros Chains. Info for Damawand hiking trekking and climbing tours. 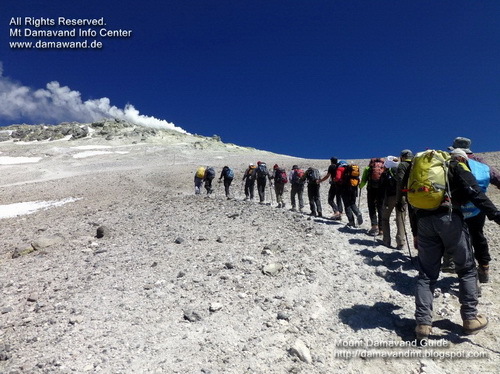 Climbing tours to Mt Damavand Iran. Demavand mountaineering and ski touring.